We’d love your help. Let us know what’s wrong with this preview of The Vibrant Table by Anya Kassoff. The Vibrant Table is a feast for the senses. From small sides to savory meals and sweet indulgences, each nourishing recipe tells a story of a balanced and well-fed lifestyle, centered around the family table. Amaranth Pumpkin Porridge, Fingerling Potato Pizza, Squash Blossom Quiche, Roasted Plum Ice Cream, Swirled Acai Cheesecake—you will never run out of inspiration for The Vibrant Table is a feast for the senses. From small sides to savory meals and sweet indulgences, each nourishing recipe tells a story of a balanced and well-fed lifestyle, centered around the family table. Amaranth Pumpkin Porridge, Fingerling Potato Pizza, Squash Blossom Quiche, Roasted Plum Ice Cream, Swirled Acai Cheesecake—you will never run out of inspiration for enjoying whole foods at any meal. To ask other readers questions about The Vibrant Table, please sign up. It's beautiful to look at, gorgeous pictures, but, to me at least, not very useful. The recipes sound good, but I think they are too cumbersome and have way too many ingredients, I got discouraged just looking at them. Not a book I will add to my collection. The book is gorgeous, with beautiful pictures. It is also nearly gluten-free (is wheat-free), which is NOT advertised in the title. I have a kid who is allergic to rice (exact status unknown, as processed rice seems to be OK now, and he won't eat actual rice), so this is very frustrating for me. I don't really understand why carob and chocolate are both used, but whatever, I am a chocolate girl. Cauliflower Pie I am gl I received this book through Goodreads' First Reads program. Cauliflower Pie I am glad I did this on a Sunday, there are a lot of stages and a lot of dirty dishes. UPDATE: Yummy. I will chop cauliflower smaller and parboil longer next time. The crust is delicious (I only used Yukon golds). I guessed on the salt because it is not listed in the ingredients. Pink Lemon Coconut Bonbons These are delicious. If I do them again, I will halve the recipe because my food processor (15+ year old Cuisinart) had a hard time with this huge amount. Also, when the melted coconut oil hit the chilled macadamias, it solidified all over the bottom of the processor container--including under the blade. Easy to clean, hard to process well. But very very yummy. My parents and husband agreed--the kids refused to try them because coconut. Apricot and Lavender Tart Yummy! I love apricots, and I love lavender in desserts (it is available from Penzey's). I couldn't find quinoa flour or tapioca starch and was not motivated to make my own of the first. Used corn starch and plain old boring whole wheat flour in place of the quinoa. I will probably make this again, but I would love to find a crust that uses wheat flour and coconut oil. Also--a dedicated coffee grinder for coconut sugar (I used white sugar, would prefer turbinado but I am out)? Who has the space to store extra stuff??? This is a beautiful book, with wonderful photography and delicious recipes. It has definitely inspired me and given me food for thought, however if I'm honest, I know that I would have difficulties getting to this level of amazing ness in my kitchen. I am surely capable but feel I wouldn't have time for much else. I know we all have busy lifestyles and as a casual teacher I may have more time on my hands than some. Even so, I tend to seek out recipes that have easy to find, simple ingredients, th This is a beautiful book, with wonderful photography and delicious recipes. Even so, I tend to seek out recipes that have easy to find, simple ingredients, that are not too time consuming. I love to take time in the kitchen occasionally experimenting and I sometimes feel guilty that our meals aren't always as wholesome as they could be, but many of these recipes require ingredients not available in my local area or lots of prep time, which isn't realistic during the week. I realise it is a question of changing habits and getting into the swing of it, I've been vegetarian for over 20 years, so I understand the adaption process, but it seems so time consuming. Nevertheless, we had fun testing out green juice, which my daughter actually liked and she is my fussy one! There are a handful of recipes I will copy and try for sure. 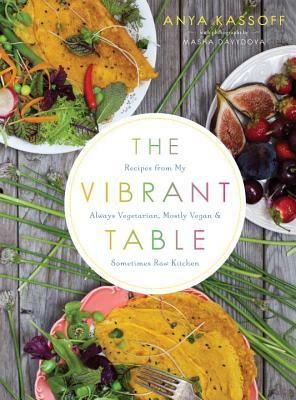 Regardless of my umming and ahhing, the title is perfect, there is plenty of vibrancy in this book and I so admire anyone who can achieve such colourful, healthy eating daily. I am quite envious! Cons: These are good recipes, but the're really all over the place and not categorized by specific diet. If you were a vegan, or raw, for example, you wouldn't know if you could eat something unless you read the whole recipe. Read-Alikes: I don't know how Ms Kassoff gets her child to eat fava-bean patties and some of the other things she claims her kids like. If you can't see yours willingly eating home-fermented oat-groat yogurt, try Organically Raised or any of Mollie Katzen's children's cookbooks. I got this cookbook through the First Reads program, and although I really enjoyed reading the author's stories she includes in both the introduction and with each recipe, I don't think I'll be making too many of the recipes myself. I'm on a pretty tight budget, and although I know many of the items called for would be good things to have on hand, I don't right now. I will definitely pass this book along to someone who will be able to use it. I think if you have the time, money, and patience to s I got this cookbook through the First Reads program, and although I really enjoyed reading the author's stories she includes in both the introduction and with each recipe, I don't think I'll be making too many of the recipes myself. I'm on a pretty tight budget, and although I know many of the items called for would be good things to have on hand, I don't right now. I rarely associate Russian/Easter European cuisine with vegan & raw cooking. Kassoff's text reminded me that it's a rather close minded stance to take. Her adaptations of traditional foods, including buckwheat, oats, beets and farmers cheese into novel and very fresh looking preparations are a useful cue that even the most ancient of foods can be adapted into new forms, textures and flavours. It's a fun way to explore traditions and modify them to suit your purpose. This is the best veg cookbook I have read because the author understands how important it is to explain to the cook why a certain ingredient is important to the whole of he recipe. The recipes are interesting and delicious and combine lots of terrific flavors that are not usually paired together. The photographs are spectacular and add much for the home cook who wants a beautiful As well as delicious dish. Some of these recipes were downright weird and unpalatable to me--like a Chocolate Loaf with 3 entire whole persimmons baked in the middle---or the Zucchini Spaghetti with Nectarines and Pumpkin Seed Pesto. But overall it's a beautiful book with a lot of healthy recipes, a handful of which I will try to recreate in my own kitchen. I totally love the beautiful photographs in this cookbook! I am going to try a few of the recipes, but for me, most of the recipes had too many exotic and difficult to find ingredients and/or were more labor intensive than I wish to be. I would totally eat all of it if someone would make it for me though! It looks fabulous! Vegetarian, Vegan and some raw recipes. Beautiful photography with many very original recipes. I plan to try the Peach and Avocado Summer Rolls. For those looking to improve their health and way of life, this book is fantastic! I can see myself using this book for many years to come. The recipes look feasible and that a larger audience may enjoy - though very healthy as well as primarily gluten and refined sugar free. Anya Kassoff's writing style is endearing and fully shares her love of cooking. Definitely a book to add to your shelf! I am glad I picked this up. There are definitely recipes I want to try, and reading about the author's journey was nice. A somewhat eccentric collection but with several recipes that I want to try.